You may not know this about me but I love designer clothing. I subscribe to pretty much every fashion magazine (and buy the others at the newsagent every month) and I'm building up a little collection of designer clothes, albeit very slowly! In fact, last night I even dreamed about owning an Alexander McQueen scarf. So when Matches Fashion contacted me about their new collections, I jumped out of my seat (Ok, maybe not literally but I did sit up a bit straighter and furiously typed out a reply!). With the depressingly imminent retreat of summer, the only thing keeping me going is the thought of the new clothes I can buy for the changing season. I've chosen a key piece from three of the most exciting collections and tell you how I would style it if I was given free reign. When it's gloomy and miserable, I like to wear colour. If I stare at it for long enough, I can trick myself into thinking that it's actually summer. Almost. 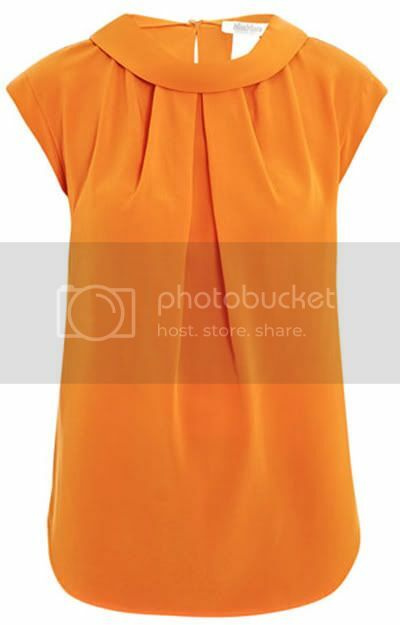 This orange Max Mara Vata top would do just the trick. I really like the vintage-inspired neckline so I would team this with a full black skirt, black opaque tights and patent ballet pumps. I love dogtooth. I think it comes from my decades-long obsession with the sixties (Wow, I'm old enough to use the plural of decade? Ouch!). I was super excited when I saw Emma Stone on the cover of last month's Vogue in a dogtooth jumper. 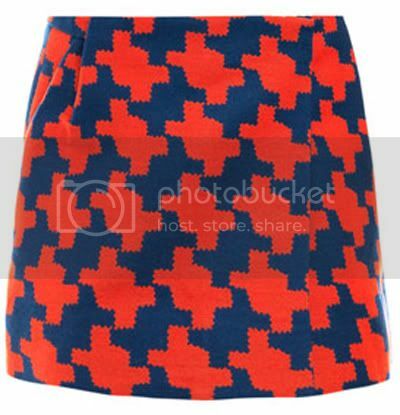 This Diane von Furstenberg Melissa skirt is even better- Look how bright it is! I'd channel the vintage vibe with a black fitted jumper, opaque tights and black suede boots. Ok, time for the big guns: Alexander McQueen. 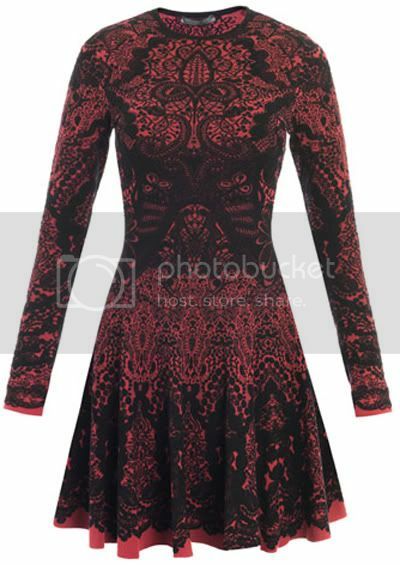 This is my ultimate fantasy dress- the Victorian lace jacquard knit dress. Look at it. The opulence. The drama. I can't take it. This is the sort of dress that Rich can hear me finding because I make my "pretty clothes noise". I'd simply team this with black strappy heels. I wouldn't want to distract from the dress. Mo Farah is my favourite athlete from the Olympics. 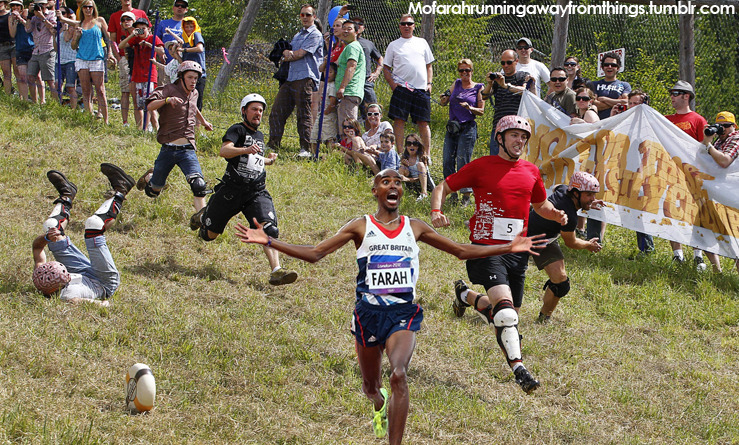 This meme, Mo Farah Running Away From Things, is absolutely amazing. I love this vintage tutorial on achieving flicked eyeliner. So pretty! I saw this image on another blog but I lost the source when I copied it over. If anybody knows where it's from, please let me know. I absolutely love the concept of Young Me/ Now Me. The basic premise is that you take photos of yourself in the same pose, clothes and (for the really extreme) location as your childhood photos. I really, really want to grab my brothers and try this! I absolutely love that you have a "pretty clothes noise"! And I love that Alexander McQueen dress. Pure heaven! I love the young me/now me photographs! That is too funny!! Oh my, those clothes are awesome! I think the orange top (my fav colour!) would look especially fab with a pencil skirt. Very Jane Holloway. And that McQueen dress is stunning. I keep meaning to buy the Alexander McQueen book when I have the spare pennies, but it always slips my mind when payday rolls around. I really ought to fix that, his work is so inspiring! Love the eyeliner tutorial, and your blog - where do I start? Anyways now following, feel free to check out my blog if you like. wow first thing <3 my heart is melting. 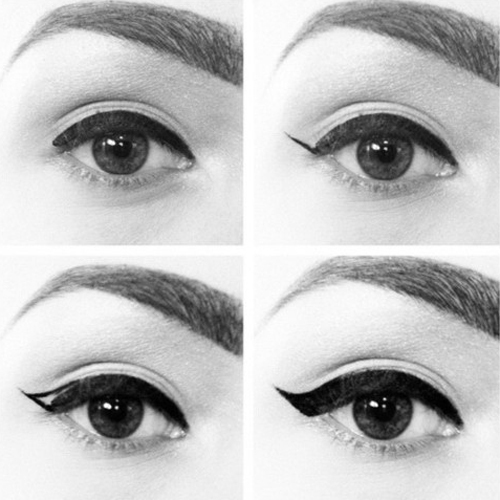 awesome winged eyeliner tutorial! definitely doing it! Hopefully you can help me by checking my blog out and we can follow each other back. thanks!